Let me get a bit esoteric for a minute. We hunger for things that have the promise to transform us. Our search for meaning has always led us to want to understand the origin of life itself. We use science and technology to play creator in order to get us closer to the answer. Advancements in computing, artificial intelligence and robotics are all a part of that search but nothing brings us closer to being a creator of our own reality than Virtual Reality. After many false starts, the VR industry is finally taking hold as the largest companies like Facebook, Google, Microsoft, Samsung, Sony and many of the entertainment giants get involved. VR is not just another piece of tech like 3D to enhance a current medium, but an entirely new way to create a total experience. 3D put old wine in new bottles, VR requires change to the content itself. Like gaming, it is more akin to a world that you can wander around in without the time limits of a piece of content we sit back to watch. The leaders in VR, are exploring many different approaches. Virtual Reality may merge with a form of Augmented reality. Both Magic Leap and Microsoft HoloLens are examples of this. While Magic Leap has not officially ‘launched’, you can read about a hands on experience with Microsoft Holo Lens here. For a more in-depth look at Magic Leap take a look at some of the patents that have been filed. Samsung’s Gear is also worth checking out, as is Sony’s Project Morpheus. Oculus Rift is of course the ‘mainstream’ headset that Facebook invested in last year that everyone has their eyes on. At CES this year, they had the largest booth of any vendor and interest was at a frenzy with lines 50 yards long. At CES in 2013, Oculus didn’t even have a booth as the team ran private demos from a suite at The Venetian. A lot has changed in just 2 years. Oculus is in development of their 3rd generation headset called Crescent Bay – with greatly improved hardware design, screen resolution, greater freedom of movement and 3D positional sound. While initial application will sit within gaming and entertainment, future application will be within education and professional services. Imagine designing the home with your architect who now has the ability to offer you a walk-through before anything has ever been built allowing you to make the changes in virtual space vs racking up overages with your contractor on site. Not sure where you want to vacation? Direct samples of destinations can be observed first hand. Perhaps a future solution will trick us into feeling as if we have been there, relaxing our minds and saving us the flight. Once you sit to think about it, you start to see the many niches that will make this technology rewrite many of the experiences we currently view on flat screens: Sideline seats for Monday night football, strolling the African plains for what would normally be a very expensive Safari experience, the feeling of getting barreled on that big wave we never had the nerve to take. Todays hardware may be in the form of goggles strapped to your face, future homes may be built with Holo-Decks for a more enveloping experience to be shared in person with others instead of an avatar. Immediate opportunity clearly sits within the world of gaming. It is the closest thing to VR that we have the most experience with and it works best with our desire to interact and just plain wander. Try to create a filmed narrative and things start to fall apart as we become the unseen observers – unable to interact or effect the destiny of the narrative. How do you hold peoples attention? Turn your head to look at the mountains behind you and you may miss a crucial part of the story that is happening in the other direction. For cinematic entertainment, many things need to be worked out. For entertainment narrative, the direct interactivity of games may need to converge with a more passive form of observation. One way to do this would be to create digital avatars of the personalities we love and combine that with some form of AI, to react on the fly as the story unfolds…but I’m getting ahead of myself. We don’t know what the future of VR will look like yet, especially in entertainment, but the form it is taking today will most likely not be the form that this evolves into in the future. From a content standpoint, its the wild west. Here are some examples of how this is shaping up. Jaunt, one of the leaders creating short-form cinematic VR has some terrific downloadable experiences with top entertainers and gaming companies. Millions March shot by Spike Jonze for Vice is also a great example of cinematic VR. Mattel and Google just partnered together to launch a VR version of Mattel’s old ViewMaster. Too bad it only fits an Android device. Quite amazing that Mattel decide to not create something more open platform given an app for this would be pretty simple and content creators are hungry to contribute. Two other content ‘Labs’ worth watching are Felix & Paul, along with Wemo located in Venice, Ca. Wemo also has a consumer/industry facing informational site that keeps up with the latest in VR. Intimacy. A real 1-on-1 connection with someone else, an experience specific to a person’s POV is challenging. The framed image (movies) is subject to manipulation in a way the frameless image is not. Theater actors translate best to the VR space because it takes us back to the frameless time before cinema. Theater may be a better starting-off point than film. Adoption will be predicated on people caring more about the character/world/environment than just being curious about the technology. VR live film does not give you the depth & stereo effect. You are a passive observer and cannot navigate. Games and pure synthetic content do not have this limitation. You cannot control where someone looks. How do you direct narrative if this is not a game? 99% of current VR experiences out there are bad. When people ask what to try with cardboard VR, there are ‘maybe’ 2 good experiences available. We need better experiences for people to believe in order to increase adoption. Integration of real space with virtual space to inhibit you from bumping your shins into your own coffee table. What is reality anyway. Some say our dreams are as legitimate as our waking hours. Virtual reality may just be another expression of our consciousness…so real that we confuse the two as we sometimes do our dreams. Our goal is to create ‘unmissable cultural moments’ that exist only in VR. To create another waking moment..another reality. 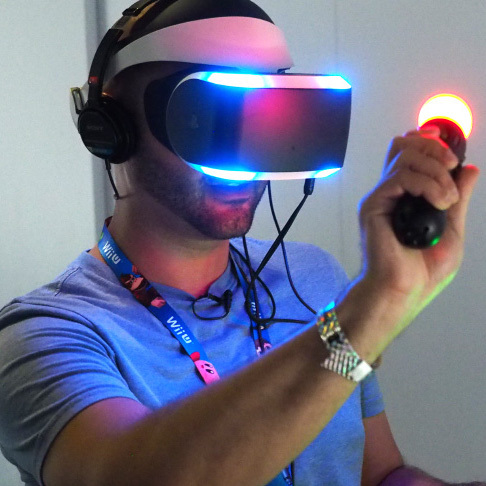 While VR may be a way off from being our new reality, it is certainly going to be one of them. Could Virtual Reality Make Us Better People? This entry was posted in Apps, Brand Content, Branded Entertainment, Content, Content Marketing, Digital Video, Entertainment, Gaming, Technology, Virtual Reality and tagged Facebook, Felix & Paul, Google, Holo Lens, Jaunt, Mattel, microsoft, Oculus, Oculus Rift, Rift, Samsung, sony, ViewMaster, Virtual reality, VR, Wemo. Bookmark the permalink. « Waking up to meditation instead of technology.